Animation from India: a critical look for furry fans – by Fred Patten. From the point of view of furry fandom, they don’t have any anthropomorphic stars. That became clear this afternoon (November 19th), when India’s Animation Xpress announced that Vaibhav Studios of Mumbai had just created two CGI animated TV commercials (in Hindi) for Centre Fruit Xplode candy gum, with juicy orange and lemon flavors. “One of contemporary India’s finest animation companies, Vaibhav Studios and independent music producer, composer and multiple award winning musician Roto Shah, recently collaborated on a new animated commercial for ‘Centre Fruit Xplode’. Vaibhav Studios was commissioned by none other than international adv’t agency giant Ogilvy & Mather, headquartered in Manhattan and with 450 offices in 161 cities worldwide. Its Indian client “wanted the entire campaign for the launch of the new brand Centre Fruit Xplode to have an animated twist”, so O&M went naturally to Vaibhav Studios, which has a reputation for creating CGI animated TV commercials. Vaibhav Studios took it from there, writing and designing the two TV commercials with the anthro orange and lemon. The Animation Xpress article (a disguised press release) gushes about how Vaibhav Studios’ founder Vaibhav Kumaresh goes into detail about how the two commercials were made. But the two commercials speak for themselves. Yep, they’re an anthro orange & lemon, all right. But considering how they go SPLAT!, they’re not likely to have any lasting popular appeal. Most of Vaibhav’s TV commercials are like this. Take the TV spots for Fevicol adhesive, starring two friendly elephants. These have been going for some time; but again, the elephants have no life beyond Fevicol’s advertisements. Even Vaibhav’s animated programming that contains anthro animals is not particularly memorable, because those animals don’t exist beyond the TV program or movie. Here’s one; commercial in English for the Hindi movie. In fact, Vaibhav Studios has created an English-language website and is recruiting North American animators, if you know any that will move to Mumbai. That’s not such a bad idea, considering that Prana Studios, who did the CGI animation for Disney’s Planes and Planes: Fire & Rescue under a Disney subcontract, and Disney’s Tinker Bell direct-to-DVD releases, are also in Mumbai. All kidding aside, India just does not have any long-lasting anthro animal stars. What theatrical animated features starring anthro animals has India had? 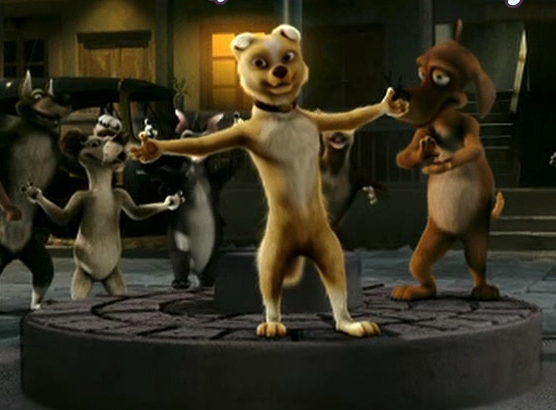 Roadside Romeo – a lot of furry fans may love it, but it bombed so badly at the Indian box office that it set all Indian theatrical animation back several years. You definitely have not heard about Romeo and Leila coming back for any sequels. Delhi Safari did better at the Indian box office; but again, none of its anthro animals went on to any life beyond the movie. Besides, it’s too ecology-preachy. The only Indian anthro animal who’s popular beyond a single feature is Jaggu the talking blue monkey; and he’s only a very minor sidekick in the Chhota Bheem movies & TV cartoons & comic books starring the human super-8-year-old – which are not translated; they’re all in Hindi. I don’t count the Hindu gods who have starred in numerous Indian animated religious movies, like elephant-headed Ganesha or monkey-headed Hanuman. If I have missed any, please tell me. But I don’t think so. Disney has been aggressively pouring all of its animation into India, so the Indians are getting so much Mickey Mouse and Donald Duck that they don’t feel any need to develop their own anthro animal characters. That’s too bad, because India is such a large country, with the potential to have very intriguing anthro animal characters of its own. If you like Indian movies with anthropomorphic animals, you may want to check these two trailers out. Both features were completed years ago, and have gone unreleased following the box-office disaster of “Roadside Romeo”. “Koochie Koochie Hota Hai”, a romantic teenage time-travel musical-comedy, is maybe coming in 2015, but don’t hold your breath. It’s been scheduled and postponed at least three times since 2011 already … oh, it’s October 2018 now? Goody. “Koochie Koochie Hota Hai” is by Prana Studios, which is so busy subcontracting CGI animation for American studios like Disney’s “Planes” and “Planes: Fire & Rescue”, and Summertime Entertainment’s “Legends of Oz: Dorothy’s Return” (talk about theatrical disasters; but that’s not Prana’s animation’s fault), that I wouldn’t be surprised if it is giving Indian production bottom priority today. As for “Kamlu … Happy Happy”, this “coming soon” trailer was released in 2012. Since then, nothing but silence. “Hindus are upset at Hindu god Shiva themed slot gambling game titled “Shiva”, calling it highly inappropriate. Developed by Merkur Division of Espelkamp (Germany) headquartered Gauselmann Group, “Shiva” slot gambling machine shows a blue four-armed Lord Shiva with dark red lips carrying damru in one hand. This five-reels and 50 win-lines gambling machine, besides Lord Shiva symbol (which substitutes all symbols) also shows symbols of cobra, Taj Mahal, monkey, etc. “Step into the realm of the god Shiva and experience an exciting adventure!” a website announcement says. It can be played live on various online casinos. Lord Shiva, who is a Hindu God of Death, is not usually considered favorably by U.S. non-Hindus. Is this game available in Las Vegas? Okay, Shiva the Destroyer is the Hindu god of warriors, warfare, and destruction, and Kali is the goddess of Death. But whoever heard of warriors, warfare, and destruction without death attached to them? Kali, despite her usually sinister appearance, is more of an angel of death who brings recently departed souls, usually dead of disease, old age, or (in pre-British India) starvation and assassination, to their afterlife. Everyone dies sometime, right? Kali can wait. It’s Shiva who is more likely to bring violent death to you.